A total of £1.26 billion was spent by Premier League clubs this Summer, slightly lower than last Summer’s £1.4 billion, the first time this has dropped since 2010, possibly owing to this Summer’s adjusted Deadline Day, and shorter transfer window. The highest inflation-adjusted fee of all time was spent on Ukrainian striker Andriy Shevchenko, whose £29.4 million fee would have cost £144 million, had Chelsea have bought him in this Summer’s transfer window. The 1,721% inflation rate applied to Premier League footballers would now see a pint of milk cost a whopping £7.62. 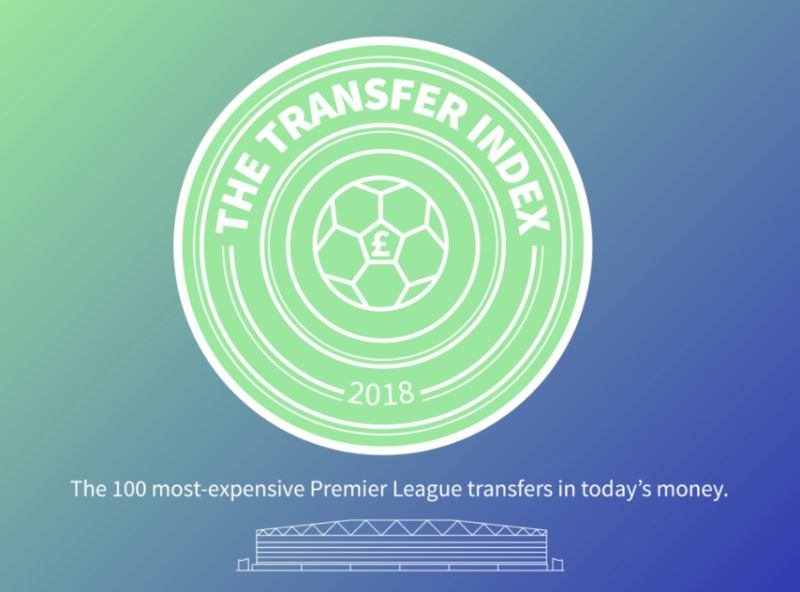 We’ve taken the average transfer values of players since the English Premier League began in 1992, and compared the increase in transfer costs over time. From this, we calculated what we call ‘football player inflation’. In case you hadn’t noticed: footballers cost a lot of money. In August 2017, Brazilian striker Neymar broke world records when he transferred from Barcelona to Paris Saint-Germain for a whopping £198 million. He’s thought to be one of the best players of his generation. But, the same was once said about Thierry Henry — who topped close to £10 million when he transferred to Arsenal in 1999. So, why are footballers worth so much more now? And how much would our favourite footballers be worth if they were bought today? Favourite footballers: how much would they be worth now? Although there’s no danger of poaching the defender now, it would set football clubs back some £125 million if he was still up for grabs. Although a defender, ardent Manchester United fans will surely remember his goal-scoring header in 2006 against rivals Liverpool, leading United to victory in the 90th minute. Opinions are certainly divided when it comes to the Irish midfielder, but those happy to turn a blind eye to his controversial tackles would now fork out £113 million to secure the relentless player. Opponents, beware! Look at what happened to poor Alf-Inge Håland. The footballer turned Politician (David Beckham, take note) made Champion League history in November 2005, scoring all four goals in Milan’s victory against Fenerbahçe. Those hoping to land such a skilled striker today would pay £144 million. Chelsea fans might question that cost, where Shevchenko’s performance took a comparable turn for the worse, scoring just nine goals in 48 Premier League appearances for The Blues. Despite his play-acting during his time with Chelsea, the striker still secured a number of accolades playing for the club. These include fourth all-time top scorer, and most goals scored by a non-English player. Today, football clubs would stump up £116 million for the striker. The former Newcastle and England captain is accredited with breaking the world transfer record (£15 million) in 1996, scoring the most goals in Premier League history (260), and the most Premier League hat-tricks (11) to name but a few. Newcastle fans may remember Shearer’s 13-minute hat-trick against Leicester City in February 1997, which took a 4–3 victory. The striker would cost £142 million today. Someone missing? Don’t worry — our interactive table has the full list. Why are football players now so expensive? The rules of supply and demand apply to football as well; the increase in transfer funds aren’t matched by the increase in world-class players. The solution? Better players — and more of them. But, how come there’s now more money in the transfer pot? A crowd of football fans used to have very few women and children. Today, football isn’t quite the “men only” club. Stadiums have worked hard to appeal to more people, especially children. They understand that creating a good first impression on a young supporter can secure a fan for life. For some stadiums, this includes Family Zones with face painting and junior-sized kiosks, as well as discounts on family season tickets. More fans than ever now flock to stadiums to watch games live — and this boosts the football club’s income. At one time, games were broadcast on very few channels; you might have set the VCR to record it, and those who couldn’t watch it might have listened to commentary on the radio. If not, fans would scroll through pages of teletext and watch Match of the Day to get the highlights. Fans can catch games much more easily today. Matches are on more channels, fans can sign up to pay-per-view games and specific sports channels, as well as catch up online. Watching a full game isn’t as uncommon as it used to be. And because they’re more easily seen, any advertising that runs off the back of it is seen by many more people — a huge revenue booster. Matchday revenue plays a big part in boosting the amount of money clubs have to spend on transfers. Each season, teams sell new home and away kits, which can often be personalised for an extra cost. Want your child to walk onto the pitch holding hands with a beloved player? It will cost you. In short, the better a team, the more fans it’ll have — and the more opportunities there are to turn a profit from football merchandise. Let’s be real: the everyday person doesn’t think of money in terms of millions, let alone tens of millions. So, here are some examples of what things would cost if inflation had gone up in line with football transfer fees. According to Nationwide Building Society, the average house price in 1992 was just over £52,000. This would make the average house price close to £1.2 million today. But what about everyday items? The Office of National Statistics (ONS) says the average price for a pint of milk in 1992 was 34p. The same luxury today would cost £7.62. A loaf of sliced white bread was 55p in 1992. Had inflation gone up as much as football transfer fees, we’d pay £12.32 for a loaf today. Ouch. Similarly, a litre of fuel would cost £11.20 today, instead of the meagre 50p in 1992.